Spectacular views! Pond near cabin! Secluded! Cane Creek cabin is accessible by road and is located on a 110 acre private nature preserve surrounded by the Daniel Boone National Forest. The cabin has two stories; the first floor contains the kitchen, bathroom, living room and games room, and the second floor has four bedrooms. 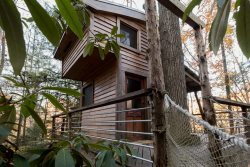 Cane Creek cabin can very comfortably sleep 10, and LINENS ARE INCLUDED WITH EVERY RESERVATION. The Cane Creek cabin is located outside the Red River Gorge geological area and has ample outdoor space for recreation, including private hiking trails and ponds on the preserve. The fishing pond contains bass, bluegill and catfish among others! The Cane Creek cabin is an excellent choice for groups and families who prefer a quiet respite from the bustle of the state park and Red River Gorge areas, but who do still want to be a short drive away from both! And is a wonderful cabin choice for week, or even month-long, visits! We offer discounted rates for midweek rentals (Monday-Thursday). These lower rates will appear in your reservation total upon checkout. Also, please call to inquire about special rates for longer stays! Kitchen: Complete kitchen with gas stove and oven, refrigerator, double sink, microwave and coffee pot. Cookware, dishware, soap and cleaning linens are provided. Living/Dining: This cozy living space has a family-size corner couch and adjacent game room with a foosball table. The kitchen has a table fit for 4. Bathroom: There is a full bathroom with a sink, toilet and shower. Bedroom: There are four bedrooms upstairs - one with two bunk beds, two with double beds and one room with a queen bed. Additional Amenities: Air conditioning, wall and space heaters, covered porch with furniture, forest service charcoal grill, TV (DVD only), and private fire pit. Linens are provided at Cane Creek. Unlike most of our other cabins, linens are included in your stay at Cane Creek.